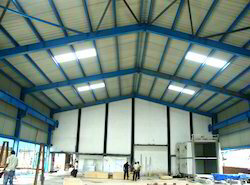 Leading Manufacturer of pre engineered building from Chennai. Pre engineered building is a steel structure built over a structural concept of primary members, secondary members, and the cover sheeting connected to each other. The structural members are custom designed to be lighter in weight as well as high in strength. For today and in the future, Steel has become the material of choice in building construction, compared to concrete and timber. Thus steel building designs have become more flexible, durable and adaptable. As a leading PEB manufacturer Kirby provides the complete service of engineering and fabrication thus ensuring better quality control at every stage of the process.